The Sint Maartenskliniek (SMK) is the only clinic in the Netherlands specializing in posture and movement. Its reputation attracts patients from all over the country, for treatment of simple or complex orthopedic disorders. The clinic’s long-term relationship with Materialise brought them to a significant milestone not so long ago. This is the story of a case that led the way to the 70th aMace case for SMK. Dr. Spruit and Dr. van Hellemondt are orthopedic surgeons at the SMK in Nijmegen. In 2011, they worked on their first case together. The procedure was the first in which a Materialise aMace implant was used at the clinic. Their first aMace patient was Mr. Theo Geene. He had already undergone a hip replacement operations at a relatively young age. After suffering from a fracture to the ceramic head of the primary prosthesis in his pelvis, he had a first revision surgery in 2006. A few years later, he sought further treatment at the SMK because the cup-construction was failing. Walking, standing still, or lying down made no difference. The pain was very present and getting worse. Dr. Spruit and Dr. van Hellemondt met with Mr. Geene in 2011. As the aMace had just come out in 2009, it was the perfect timing and opportunity to help their patient with innovative 3D technology. Mr. Geene became the first patient in the Netherlands to receive the aMace implant. Soon after his procedure, Mr. Geene gained back his mobility and was freed of pain. More than 7 years later, there have been no mechanical issues or problems with his implant. A little over six years later, Dr. Spruit and Dr. van Hellemondt have already completed their 70th case with an aMace implant. Dr. van Hellemondt says it’s important to point out that they have not experienced mechanical failure in any of the 70 cases, and can consider their results over the past 6-7 years, very positive. To begin with, working with a very good planning report helps them in the preplanning phase. It enables them to visualize and analyze the defect without the implant. The second benefit, he says, is the preplanning in relation to the direction and fixation of the screws. It’s possible to analyze on beforehand the presence of bone stock to assist in the placement of screws. 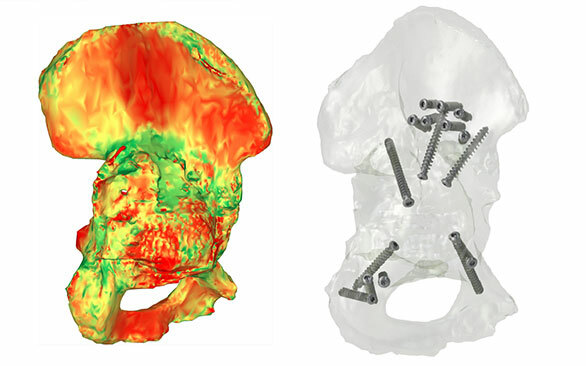 The third advantage is that during the surgery, there’s the possibility to use the 3D-printed hemipelvis to visualize the bone anatomy and to verify the fit of the implant. The patient-specific metal (titanium alloy) triflange implant has an integrated defect-filling porous augment. This patient-specific augment is intended to facilitate a good contact with the remaining acetabulum and may enable bone ingrowth and on-growth. Combined with the patient-specific instrumentation to guide fixation of the implant in the available bone stock, the solution aims at enabling long-term fixation, a key influencer for surgical outcome. As both surgeons say, 3D printing technology will become more and more indispensable. This new accessibility to patient-specific care will create a direct impact on the quality of life of patients and hopefully influence an organic integration of Medical 3D Printing in health economics. Materialise has almost 10 years of clinical experience with this solution since it went to market with its aMace implant. In the 70 cases that were handled at SMK, a number of patients once confined to a wheelchair can now take control of their lives again and live independently. An added value that’s arguably priceless. Dr. Spruit and Dr. van Hellemondt have already shared their experience with the aMace hip implant at several conferences. 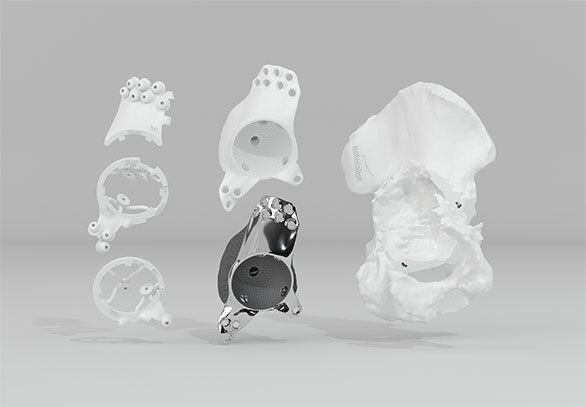 Materialise enjoys the collaboration with SMK and hope to further develop its 3D planning and printing services, while integrating valuable input from the doctors. Are you looking forward to including the aMace implant technology in your cases? Get in touch with one of our aMace specialists today. Or if you want to see more of the aMace hip implant in action, watch the webinar of dr. Med. Simon Weidert on ‘Patient-specific implant for post-traumatic acetabular defect reconstruction’.